Immortals seem to be the next big thing in YA literature. I remember reading "The Immortal" series by Alyson Noel a few years back, not to mention the exciting "The Archers of Avalon" series by Chelsea Fine more recently (check out my review for the final installment, "Avow"!). When I kept seeing Jodi Meadows's "Incarnate"popping up on my recommended list, I decided to give it a go--after all, who can't resist a stunning cover like that? I especially love the iridescent butterfly mask, which you'll see plays a symbolic role in the story! Ana has always been told that she's a nosoul, a nothing. Even her own mother has kept her away from society, ashamed and disgusted by her daughter's abnormality. For thousands of years in Range, a million souls have been reincarnated over and over, keeping their memories and experiences from past lives. When Ana was born, a soul vanished forever, and no one knows why. Eighteen years later, Ana travels to the city of Heart, but its citizens are afraid of what her presence means. Only Sam believes that Ana's new soul is good, but will the two alone be able to uncover the mistake that gave her someone else's life? One of the major elements of "Incarnate" is the romance between Ana and Sam. In fact, the entire first half of the book--maybe even the first three-quarters--revolved around the development of their relationship. I don't know whether this is because I finished the book fairly quickly, but I felt like their romance happened a bit too suddenly, and stretched on for ages. It was literally at the moment Ana realized who Sam was that things immediately jumped from 'tentative, nice stranger who's actually nice to me' to 'wow he is one attractive fella, his lips, his touch!' This is not to say that their relationship was sweet--I definitely saw the connection between the two--it was just way too quick, and that made it seem a little unrealistic to me. I think if there was some more development of that connection, and maybe if the whole focus on their relationship didn't drag on unnecessarily for so long, the depths of their feelings for one another would be more believable and poignant. Ana herself was a fairly interesting heroine to follow throughout the book, given her unique circumstances of being the only new soul among thousands of other people. Her emotional journey of finding confidence in herself despite being shunned by everyone else as a nosoul made her a strong, likable character, and she's generally brave and strong-willed. That being said, other than her strength in character, I didn't find Ana a particularly compelling character. I wish Ms. Meadows had brought us deeper into Ana's mind and thought process rather than using Ana as a means of narrating the story. Likewise, there were a lot of redeeming qualities to Sam. He's kind, caring and passionate, yet he still has one fatal fear that makes him a little more of a three-dimensional and believable character. Despite this, to me, he wasn't an especially exciting character. He seemed more passive and besides from the beginning part when he first rescues Ana, Sam just kind of became a boring character. Even his fear wasn't something all too deep, I think. It was pretty simple and almost shallow. It's just a shame because he started off as a character who stood apart from the rest of society, but as the book progressed he kind of faded. One of the biggest disappointments for me in "Incarnate" was the storyline. There's such huge, amazing potential for the plot to be incredibly exciting and engaging, with sylphs and dragons and reincarnations, but it just dragged on and on, and the climax, when it did come, wasn't very 'climaxy' at all. Like I mentioned before, a large portion of the book was based on Ana and Sam's romance that showed its buds way too suddenly and took a crazy long time to actually bloom; it was pretty unnecessary. As for the climax--just what?! It wasn't much of a climax at all. If the climax were a shark in the water, it literally surfaced for a breather, then submerged itself in the ocean again. 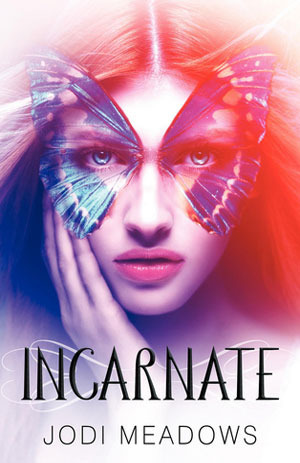 Overall, "Incarnate" wasn't such a big hit for me. While the two main characters were fairly likable, they weren't compelling enough to keep the story going in the face of a slow-paced plot. The book definitely has great potential, but it just fell flat. I probably wouldn't recommend it, though I may give the sequel, "Asunder", a shot to see if things pick up.